Once, a thirsty crow is looking around for some water. When he finally comes across a pot of water, the water level is so low that he cannot reach it. Not the one to give up, he drops pebbles in the pot till the water level rises and he finally quenches his thirst. Pretty neat, right? Animals and birds in moral stories for kids are often depicted to be smart. Yet, somehow as we grow up, we lose our belief in their intelligence. Well, turns out we are wrong. A recent study shows that Hawaiian crows (‘Alalā in native language) possess great skills for tool usage, much like the crow in the story. So far, out of more than 40 crow species worldwide, only one – the New Caledonian crow- had shown the ability to use tools. On realizing that the Hawaiian crows possess similar features to these crows, like straight beaks and forward-facing eyes, behavioral ecologist Christian Rutz suspected that these crows might be capable of using tools as well. So, he decided to test the skills of these crows. An interesting fact about these birds is that they are extinct in the wild and only bred in captivity. So all the living (100 or so) birds of this species could be tested in these experiments! Photo Courtesy: Discovery of species-wide tool use in the Hawaiian crow. In a well-crafted experiment, researchers placed food-baits inside drilled holes and crevices in a piece of log. Small and large sticks of different lengths were randomly placed nearby. 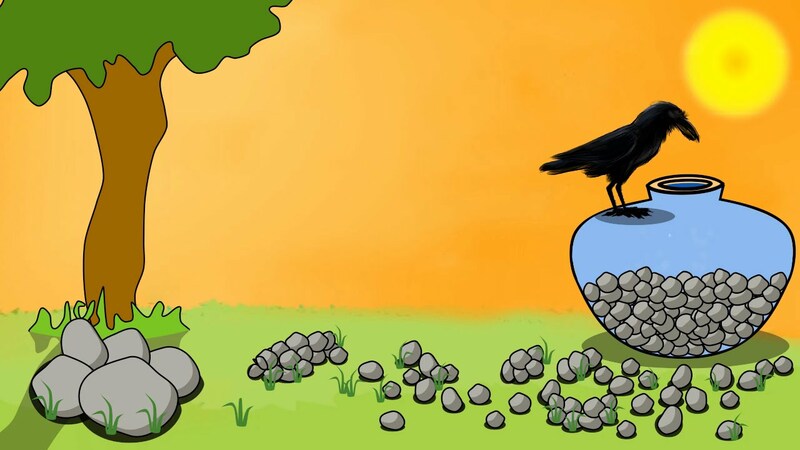 The researchers observed that almost all crows extracted food from the holes using sticks as tools; they managed it within a minute! A large number selectively chose the correctly sized stick, modified them, or even replaced the wrong tools with the appropriate ones to fish out their baits. A few juvenile birds were raised in the absence of older crows to check if this wisdom is inherent or ‘learned’ from other crows. These fledglings raised in isolation could also use tools, indicating that they don’t need to learn these skills from other crows. Do Isolated Islands Influence Animal Behavior? Interestingly, both crow species are inhabitants of isolated islands. Is this relevant? It could be that tool usage evolved in isolated birds because they face less competition for the same food bait and fewer predators in these areas. This allows them the additional time needed in constructing and using tools: a luxury that mainland birds cannot afford. A few of these crows will be released in the wild in near future, and everyone is curious to see if they show similar behavior in the wild, as we have no evidence of that yet. Rutz, Christian, et al. “Discovery of species-wide tool use in the Hawaiian crow.” Nature 537.7620 (2016): 403-407. Posted in Birds, Nature, ScienceTagged alala, animal behavior, Animals, biology, birds, crow story, crows, Hawaiian, islands, Research, Science, smart crow, thirsty crow, tool using birdBookmark the permalink.